Video: Get ready for your trip to the Milwaukee Art Museum! Optional: Go hands-on at Betty Brinn Children’s Museum with guided exploration and play. Additional fees apply for Betty Brinn Children’s Museum. 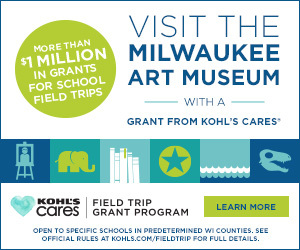 Register with the Milwaukee Art Museum, and then call Betty Brinn Children’s Museum at 414-390-5437. Join America’s Black Holocaust Museum (ABHM) and the Milwaukee Art Museum for a special program in honor of the local and national history of African Americans and people of African descent. The combined presentation by ABHM griots (storytellers) and Art Museum docents is a timely collaboration that explores how artists express identity and use storytelling to bring history to life. Join the War Memorial Center and the Milwaukee Art Museum for a special tour that examines American stories and resilience from a variety of perspectives. Students will enjoy a 45-minute guided tour of the War Memorial Center and a 45-minute docent-led tour of the Milwaukee Art Museum that looks at diverse American stories on resilience from past to present. Note: Space is limited. Please be flexible when requesting dates. Discover connections between art and the life sciences. See how artists use their senses and borrow from the sciences to observe the natural world. View works of arts that cover living things from plants to wildlife and humans. Optional: Visit Discovery World to continue your exploration of the living world! Examine living fish from Lake Michigan and see firsthand how science uses art for animal identification. Additional fees apply for Discovery World. Register with the Milwaukee Art Museum, and then call Discovery World at 414-765-8625. Be the Artist! Students explore the Museum’s Collection on a tour of your choice (see pages 6-7), and then complete an art project connected to the tour theme. Extend your MSO Concert for Schools experience with a docent-guided tour of the Museum’s works that relate to concert themes. Additional fees apply for MSO. Register with the MSO at 414-226-7886, and then call the Milwaukee Art Museum. Extend your First Stage performance with a docent-guided tour of the Museum’s works related to the performance themes. Additional fees apply for First Stage. Register with First Stage at 414-267-2962, and then call the Milwaukee Art Museum. NOTE: Space is limited. Please book early. This tour, inspired by the National Writing Project at Carroll University and grounded in the Six Traits of Writing framework, introduces the Museum as a place of inspiration for writing. After receiving their own Museum journals/sketchbooks, students look closely at works of art, using a variety of writing skills, developing a descriptive word bank, and practicing "low stakes" writing. For more than forty years, the Junior Docent School Program has introduced elementary school students to the vocabulary, elements, and history of art while developing critical thinking skills. Over three consecutive years, students visit ten times, contextualizing art into their life. After a culminating project presented to their peers and family, they become official Junior Docents! To be added to the waiting list for this program, please email teachers@mam.org. This program is run through schools. If you are a parent looking for art opportunities for your child, please refer to Youth and Family Classes.